Editor’s note: This piece was written in the AWWP Teenage Writers Workshop. 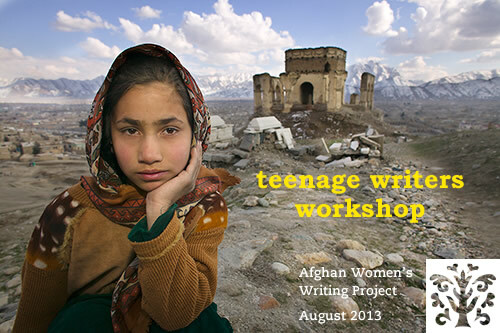 Look for more writing by young writers aged 12-15 next week. Last winter, my family traveled to Kandahar to visit our relatives, as we do every year. I really enjoy these winter visits. One day last year, I went to my aunt’s house to fly kites and play hide-and-seek with my cousins. They keep cows, goats, sheep, and a horse, and I visited with the animals too. Another day, I rode the horse. It was a very good day, just playing with my cousins while my mom visited my aunt. Later, my mom wanted to see where I had been. I took her to the animals and one of the cows was giving birth to a calf. That was something! When a calf is born, people cook good food. Still another day, I went to a wedding party for friends of my cousins. When it was time to leave, however, I couldn’t find all of my cousins. They had returned to my aunt’s house one way, and I went another way. I was wearing a blue and white punjabi dress. I soon saw three men wearing black clothes and turbans like the Taliban. “Do you have a little sister?” one man asked. So I went with her, and I bought food that was very yummy. When my family found me, everyone laughed because I was lost but I was thinking only about food and not about getting home. I was so small then. And now my cousin had said that I shouldn’t go outside to play. I told my story about getting lost to everyone. It was a happy, sad, funny,and joyful winter for me in Kandahar. I hope you will keep writing too! You painted such a clear picture — I almost felt that I was right there with you. I was very frightened for you when the men told you to go get your little sister! I’m glad everything turned out O.K. I will be glad to read your next story. It was a pleasure to work on this story with you. Your description of that day and all that you saw, felt, and experienced is lovely and moving. Look forward to more soon! Thank you very much for your sweet ideas. They are very important to me. Thank you for a very moving story. You must have been really frightened when you saw the men. You sound like a very brave girl. I hope you keep writing about your experiences! That was a very touching story, I can imagine myself and being in your place. i would have been really frightened if I were you, but you managed to keep calm: well done. I hope you keep writing more!